Tomorrow, All Saints Day will be a big day for Saint Damien as we celebrate with ourl newly ordained saints from the islands. As you can see by the photos taken today, both the Cathedral of Our Lady of Peace and Iolani Palace are getting all decked out for tomorrow's celebration. It will begin with the celebration of Holy Mass at the Cathedral of Our Lady of Peace in Honolulu. 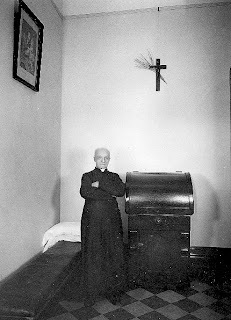 It is where Father Damien de Veuster was ordained a priest. 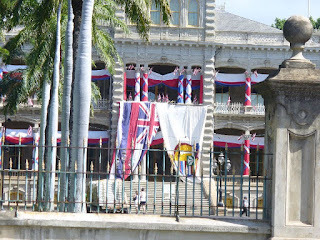 There will be a prelude concert at Iolani Palace by the Royal Hawaiian Band from 1:00 p.m. to 1:45 p.m. The Procession from the Cathedral to Iolani Palace will begin at 1:00 p.m. (following the conclusion of the Mass). The participants in the procession include the brothers and sisters of the Sacred Hearts Congregation, Bishop Larry Silva of the Honolulu Diocese, Cardinal Danneels and 13 visiting bishops from California! From 2:00 p.m. to 2:55 p.m. there will be notable speakers such as Princess Abigail Kawananakoa, Bishop Silva, Lt. Governor James "Duke" Aiona, plus dignitaries from other churches. At 2:55 p.m. there will be a private procession to the palace's throne room. The Men of the Royal Order of Kamehameha I will then carry the relic to the nearby statue of Queen Lili'uokalani. 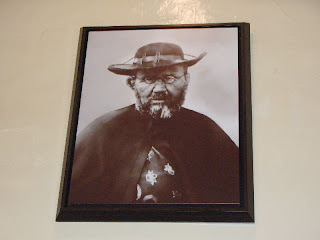 If you remember, it was Queen Lili'uokalani who visited Father Damien and who was instrumental in having Father Damien receive the honor of the Order of Kalakaua. 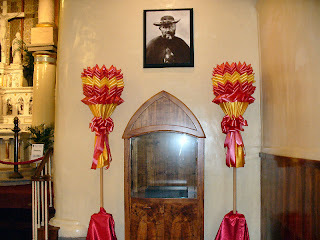 The procession will then proceed to the statue of Father Damien in front of the Capital. Young people carrying the relic of St. Damien will t hen process back to the Cathedral. The other day I posted about humble porters who were very holy and saintly. 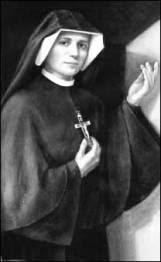 Today October 30th is the feast day of one of them. Is it just a coincidence that the lowly duty as a porter held by certain religious, produces holy saints? "...after six months was sent to the recently-founded college at Majorca, where he remained in the humble position of porter for forty-six years..."
Can you think of any other saint who was once a doorkeeper? 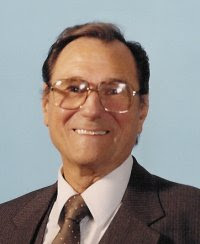 I am finishing up a new book on the life Mr. John M. Haffert. But I did not want to wait any longer to review this fine biography. For those of you who are not familiar with his name, he is the co-founder, along with Monsignor Harold Colgan, of the Blue Army now the World Apostolate of Fatima. This biography was written by Edna McGrew, a New Jersey based writer. 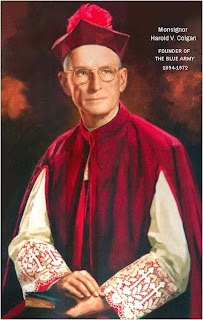 The main reason I was eager to read Ms. McGrew's new book was because as co-founder of the international World Apostolate of Fatima, John M. Haffert is a very important person for our fledgling World Apostolate of Fatima Honolulu Diocesan Division and because as a long time member of the WAF, I wanted to know everything I could learn about the man behind this renowned apostolate dedicated to our Lady of Fatima. The book started off with an introduction to the apparitions in Fatima, and some personal background on John Haffert. The first chapter has John Haffert newly married to a lovely woman by the name of Anne. "...they and their small estate are right out of F. Scott Fitzgerald's stories of the famed gold coast along New York's side of the Long Island Sound..."
But the similarity ends there because this young man was a very devout Catholic, husband, family man and God definitely had plans for him. It was amazing to find out that a man whose name is almost synonymous with Fatima, was not familiar with the apparitions at Fatima in the very beginning. I should mention that in order to familiarize herself fully with the subject of her book, Ms. McGrew did extensive research, read almost all, if not all of Mr. Haffert's books (he was very prolific) and conducted interviews. The result was a very interesting, hard to put down book. I must confess to reading it every single day, before Holy Mass. Ms. McGrew did not sugar-coat or canonize Mr. Haffert for the reader. No, she presented him as a real, human being who had struggles, faults, just like the rest of us. Yet, this man was a very holy man. His entire life was dedicated to God and His blessed Mother, whether through the Scapular of Mount Carmel or Our Lady of Fatima and the Blue Army pledges, he was determined to enlist more and more people in our Lady's growing army. It was the only way to fight the evils that assailed the world from the beginning of time. He took very seriously the idea that the Rosary and the Brown Scapular were weapons people everywhere, (and not only Catholics) could successfully use against the devil and his demons. One of my favorite chapters is found almost at the end of the book. It is entitled "Power Players". I am reluctant to share much on it for fear of spoiling the chapter for you but I know you will enjoy reading the following. "John believed in the power of prayer and the need for power players. 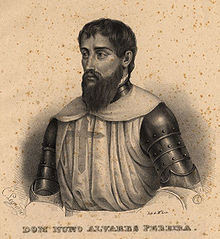 He was convinced that his Marian Apostolate would succeed only through the power of many prayerful individuals. He writes: "I had to find saints. And I made a conscious effort to do so. I cultivated the acquaintances of devout people." 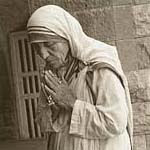 Well, one power player was none other than Blessed Mother Teresa of Calcutta! "When Mother Teresa heard of the Blue Army, she and all the members of her community, became early members. Not only did she visit the Blue Army Shrine of the Immaculate Heart of Mary in Washington, NJ but she also gave lectures there. To this day , her community regularly visits the Blue Army Shrine in Washington, NJ. Well, how do you like that? I was so excited when I read this part, I think I interrupted my mom's prayers in Church to show this part to her. 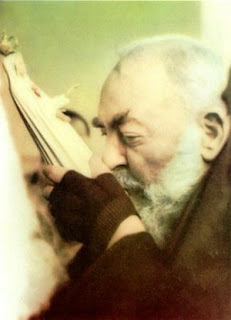 The power player that I really was ecstatic to read about was none other than Saint Padre Pio. John and Msgr. Colgan interpreted this to mean that the Blue Army members should live up to their commitment. John considered Padre Pio to be the 'spiritual Father' of the Blue Army because of this promises that he made." So you can see why I was so excited and ecstatic at reading about Padre Pio, the Blue Army Shrine and being his spiritual child! Well, I think I had better let you read the rest of the book for yourselves. I truly and highly recommend this wonderful book to everyone but especially those who are members of the Mary's Blue Army and those contemplating becoming a member. The World Apostolate of Fatima (USA) in cooperation with EWTN, televised a worldwide prayer service on Sunday, October 18, 2009 for the sanctity of life and peace. It was estimated that millions of viewers would tune in and join with prayer on this special occasion. Well over a thousand visitors came to celebrate by joining together in prayer at The Blue Army Shrine of Our Lady of Fatima. 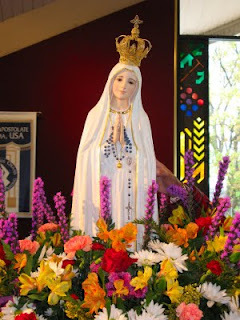 The shrine is located on the grounds of the World Apostolate of Fatima in Washington, New Jersey. Loci has all the details plus photos! Thanks Loci. Our condolences to Monsignor Georg Ganswein on the loss of his beloved mother. May she rest in peace. 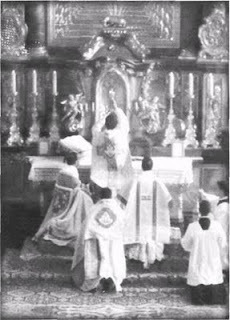 Pray for the souls of priests. If you are a blogger, would you post something on this? Would you recommend this to your prayer groups, friends and family? Unfortunately, many people today think yoga and Reiki are something that is compatible with Christian doctrine. Nothing could be further from the truth. Even though in many communities, "Christian" yoga and Reiki may be used, it is contrary to what the First Commandment teaches us. They instruct us to go down to the level of human realizations that are man-made and not from God. This is very dangerous. Also, the Church cites idolatry as being against the First Commandment, saying: "Idolatry consists in divinizing what is not God. Man commits idolatry whenever he honors and reveres a creature in place of God, whether this be gods or demons." The New Age ideology promotes self-divinization in many forms. 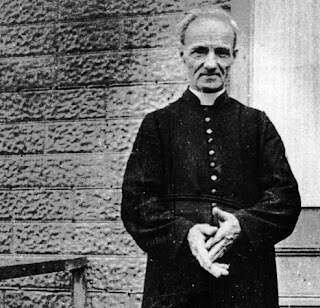 A Vatican decision has moved Montreal's Brother Andre one step closer to being canonized. 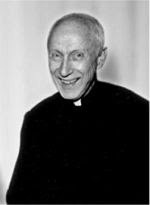 The Theological Commission for the Causes of Saints at the Vatican accepted unanimously on Saturday the healing powers of Brother Andre, a pious porter at College Notre Dame who went on to found St. Joseph's basilica. He has been credited with healing the sick, the lame and the blind. A commission of cardinals and bishops will now begin to study the suitability of extending devotion to Brother Andre throughout the Universal Church, the final step before the cause for canonization goes to Pope Benedict XVI. 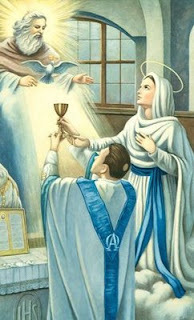 I want to wish all our beloved priests a very happy and blessed Priesthood Sunday. You will all be especially remembered in my prayers today. to repentance and return to You, O Lord. tarnish the sanctity of priests for You can do all things.